The student and practitioner of homeopathy must be able to differentiate between remedies with similar symptom pictures in order to pick the right one for the patient. Keynotes and Characteristics with Comparisons of some of the Leading Remedies of the Materia Medica provides information on the individual characteristics peculiar to each remedy. Categories: Health, Health and Medicine, Homoeopathy, Mind, Body, Spirit. Tags: homeopathy, 9788131901243, alternative medicine, alternative therapy, complementary medicine, complementary therapy, health, homeopathic medicine, homoeopathic medicine, homoeopathy. The life-work of the student of the homeopathic Materia Medica is one of constant comparison and differentiation. Keynotes and Characteristics with Comparisons of some of the Leading Remedies of the Materia Medica shows how these characteristics beome pivotal in drawing comparisons. This pivotal point may be a ‘keynote’ or ‘characteristic’. 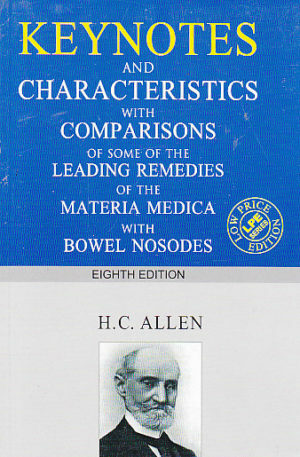 Dr Henry C Allen, MD was born October 2, 1836 in Ontario. He trained at Cleveland Homeopathic College graduating in 1892. He helped found the Hering Medical College and was Dean and Professor of Materia Medica until his death in 1909.